I few posts back, I made a statement about my last visit to my LCS, focusing on the word "last" and saying it was the subject of another post. One person caught that statement and commented that he thinks my vague phrasing may be that I have stopped going to that shop. Well, let's rip off the band aid and get to it. 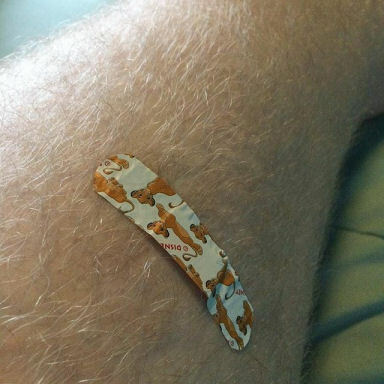 Simba will make it hurt less. Hakuna Ma-up yours. For those that haven't figured it out, I'm a pretty hard liberal. Not psycho left wing, but a far distance from moderate. Swing by my house sometime and check out my bumper sticker collection on the window in the office. Now my local LCS (5 locations with the main just 10 minutes from my house), the owner is pretty conservative. Dyed in the wool right wing. If you go to his shop, there are two TVs on. If Brian is not there, you usually have sports on. But when Brian is in the shop, it's Fox News all the time. Rarely you get a game, but that would only be on pack wars night and the insistence of the folks in the shop. We all have our views and morals. We all vote for whom we want. That's what's this place is about. I would rag Brian about Trump, but currently he is the Cheeto in Charge (who knows how much longer), but it is what it is. Brian had no issues with my left views and I accepted his right. At times we would discuss some things where we had opposing views. I can honestly say it's always refreshing to hear new angles on subjects. It's important we listen, even if we don't agree and we do not change our position. Anyway, a couple weeks back I stopped in the store after a doctor's appointment. It was National hockey card day for one thing. And since I am not buying 2017 flagship, I hoped someone has ripped boxes and cases, leaving the cards behind for the shop to resell. I was not let down. "I don't shop there anymore. They started carrying that Black Lives Matters crap so I take my money elsewhere." I was well in earshot to hear this, and while we have differences, that statement cut me to the core. I took his statement two ways. First, I see that as him not really understanding what BLM is all about and the reason it has formed. But as I thought more, and factored in his noticeable love of all things Drumpf, I felt a tinge that his statement was mildly racist. To this moment, and beyond, I don't think of him as a racist person. I probably never will. But there was too much in what he said and how he said it that shook my own morality. "He has a good point", I thought. "If you don't like the world direction a shop, company or corporation has, you have the right to take your business elsewhere". He has that right. You have that right. And I have that right. So I collected up what I had, paid and haven't gone back. Brian not shopping at Walmart is a blip on their radar, just as I not shopping at his card store will do nothing to hurt his business. If you average it out, I maybe spend $50-75 a month at his shop. My wallet will not be missed when the quarterly totals are figured. But I cannot in my right mind fail to speak with my pocket in the same way he does, or the rest of us should do. The one thing: I can afford this luxury. Sure, Brian has 5 shops in the area, and the two nearest to my house are his. But I am fortunate in this blog community to have so many shops to visit. Off the top of my head I can count 6 shops within an hour from me, plus darn near weekly card shows I can attend. Many of you barely have one of either shop or show. So this financial protest doesn't hurt me, but if I was to stop shopping at Jewel, I need my groceries from somewhere, and there's always Tony's, Mariano's, Aldi, Caputo's, Ultra Foods.....you get the idea. If anyone is in town and wants to go, I will go. But I am making a conscious effort to give my business to another establishment. And if they all support Drumpf, there's always the internet. Buybacks for the frankenset. Gem mint - I should get them graded. Double play cards. 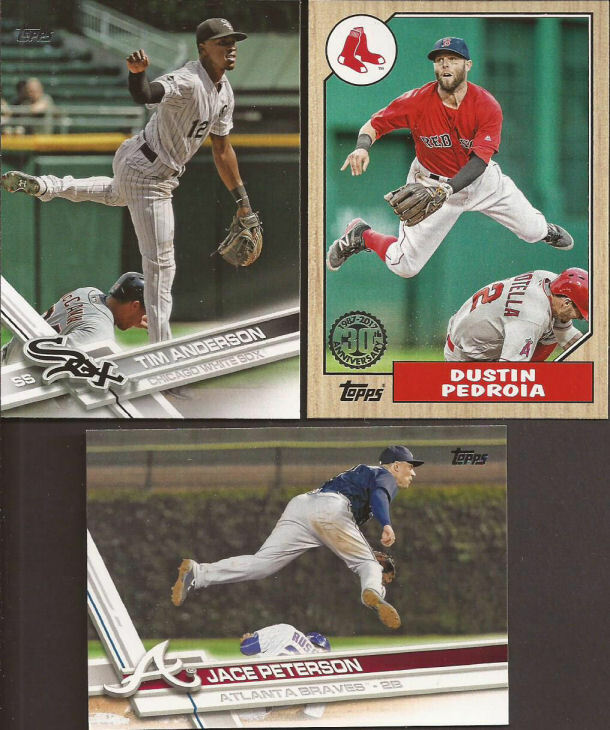 I like finding that Pedroia for this image because it shows that even the '87 Topps design is better than this year's, mainly because the image it's cut off by the horrible layout. Who is Peterson doubling off? I know it's a Cub from the weeds in the background, but I would have to squint to see the name. Or to even know that Jace was soaring over someone. Dustim? Oh yeah - there is another player in the frame for sure. Three throwbacks? Is that all in the base set? I really should stop complaining and be thankful I don't have to add too many to the binder. Someone asked for the '65 vintage box, and I was able to hit it before they put it back. Every vintage was a dollar or less. Wood goes to a soon to start PC. 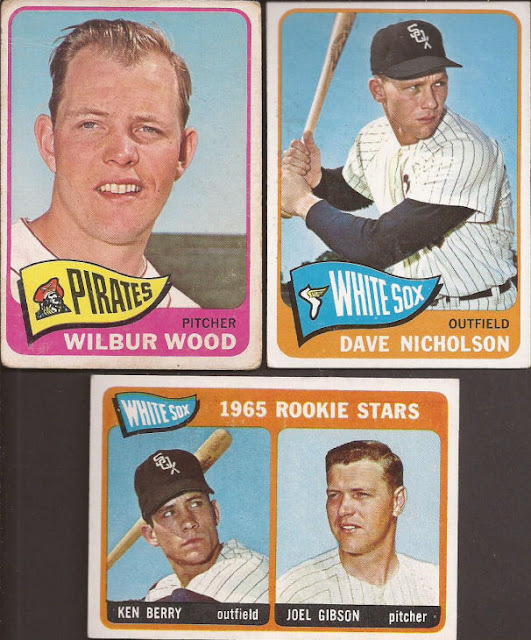 I picked up a few more White Sox for the 1965 set than just these two. Last, I showed the Stengel already, but no one will complain for another view. And yup, TTM autograph for a dollar on some loved vintage. I almost passed, but I can think of a Cardinal fan who is quite happy about one of the Final Four teams that would not refuse this card. I apologize if I got too political and thank you if you read this far. I'll do my best to only talk about cute, fun things in the future. 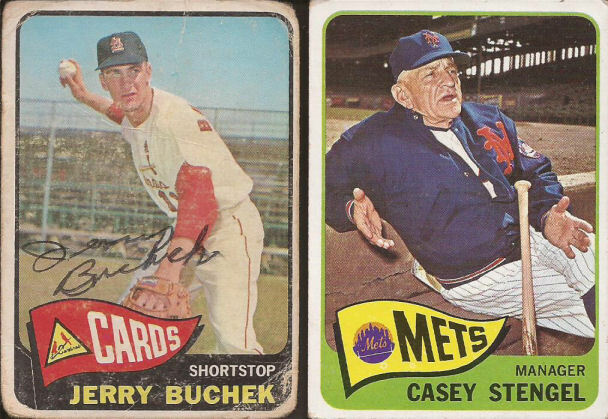 Nice buybacks, and the Stengel is great. Too bad about your LCS but at least you have some viable alternatives. It might sound petty to some, but I would absolutely do the same thing you did. There are a million reasons not to shop at Wal-Mart, and Brian found the most racist one. That doesn't necessarily make him a racist, but that's enough reason not to give him any more business in my book. Especially when you have options. That Pedroia is awesome, btw. I've had it on my wantlist since the release date. I did the same thing with my Ford dealership. For much the same reason. If they want to blast Fox "News" in the waiting room while folks are getting an oil change they can do it without me and my $$. I let them know and got a rather curt response. So be it. And you are right about that Casey! I never can see it too many times. Probably my all time favorite managers card. If there ever was one that fit him to a 't' that's the one. Whether Walmart actually sells BLM merchandise or not, I don't know, but in the south they sell lot's of stuff with Confederate flags splashed across them. So his reasoning is not only racist, but ridiculous. I have a somewhat similar story of my own too. 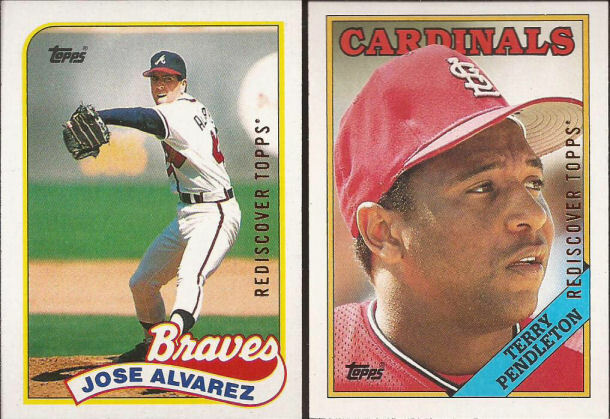 Back in 2013 when I got back into the hobby I discovered an LCS about a half hour away that is run by a father/son team. The son is in his 30's and is always good for a conversation about sports or the hobby, when he's there which he often was not when I would go in. The shop was overpriced but it was a decent place to pick up some packs and supplies and maybe find a decent deal on a box that was a few years old. The father was usually the one who would be in the shop, probably in his 70's and would talk my ear off every time I was in there. The last time I went in he started telling me this story about these two black guys coming in wanting to sell some high end singles. He refused to buy anything because the guys were black and that black people don't collect cards so they probably stole them. I had no idea how to respond to that other than to buy the supplies I went in for and never return. I think the Cub is Russell #27. I have not been to a LCS. I've heard of CK.. but.. well, you should tell me where to not go. I can't imagine it is in my neighborhood, but I'm still a bit new here. Agreed that it's Addison Russell. I was at a card show before the election, and one of the tables had a Trump sign. I think it was for sale, but it was enough that I didn't even look to see whether they had anything I'd want. I wouldn't want any part of a store whose owner thinks that the idea that black lives matter is objectionable. Hey - got the cards you sent - thanks so much!!! And kudos to you for sticking to your morals. Looking at it purely mathematically, your decision to shop elsewhere will affect his business way more than his decision will affect Wal-Mart. Wal-Mart can afford it. Can he? I vote with my wallet often. I skew a bit more conservative than you but comments like that don't go over well here either. I've been known to shop with my heart. I don't think I've dealt with had dealings involving political differences or discrimination, but there's a guy at my local flea market who I saw take advantage of a little kid and his mom. It's left a sour taste in my mouth for years and I don't even look in his direction when I do my walkthrough. On a more positive note... damn buddy... you've got 6 card shops within an hour of you? Feels like we're back in the 90's. Very cool. That'd most certainly be enough to take my business elsewhere. I don't hear much political talk at card shows (obviously) but the bits I do hear tend to be much more right-winged, sadly. I think you missed an opportunity on this one. You can shop wherever you want, but by leaving with no conversation or mention of his comment, he will continue his life unchanged, thinking the same things that prompted his comment. "Brian had no issues with my left views and I accepted his right. At times we would discuss some things where we had opposing views. I can honestly say it's always refreshing to hear new angles on subjects. It's important we listen, even if we don't agree and we do not change our position." "First, I see that as him not really understanding what BLM is all about and the reason it has formed." That was your chance to ask a clarifying question and see what his real knowledge about the situation and beliefs are -- whether he has his own opinions or is just blindly repeating someone else's hype. "But as I thought more, and factored in his noticeable love of all things Drumpf, I felt a tinge that his statement was mildly racist." "To this moment, and beyond, I don't think of him as a racist person. I probably never will." Which one is it? Is he a racist or not? You'll never know if you don't talk to him. It's not even a race thing anymore here In the states.No blacks,whites or Latinos.Your either a Trump supporter or your not.I wasn't a supporter of either candidate but I believe anything that is fueled by race ,whether a good movement or bad one,just perpetuates racism.Regardless ,it places the focal point on race. For the record I did lean more towards Trump.